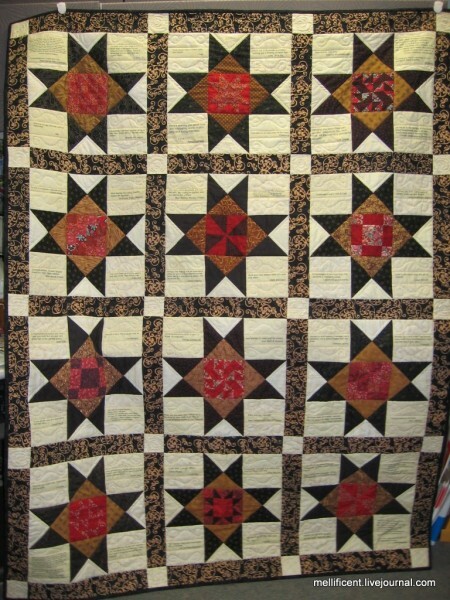 karen_d and I made this quilt back in... I'm not sure without looking - 2005, 2006? for some friends who were getting married (and are now divorced, so I wonder who got the quilt?). We had done a previous quilt together and did a weekend of work on that one in Texas (at my mom's house, actually, because that's where all my sewing stuff was, for the most part), but for this one I went to Michigan and we worked at her house instead. I had done the red centers (which are 4"? - god, I'd forgotten I ever did anything that small - sampler blocks) in advance and she had done most of the work on the big stars and and made the white blocks with various printed sayings and well-wishes on them. So we worked all weekend on putting it together and we had the "quilt sandwich" by the time I left - that means, for the uninitiated, the quilt top, the batting in the center, and the quilt back - all pinned together and ready to quilt. Karen did most of the quilting and then she mailed it to me and I did a bit more quilting (and I think made a label) and put the binding around the edges - and then we mailed it away. I've always loved this color scheme. We found that black-and-brown batik somewhere and that was what tied the whole thing together.